Cas Pollen is a designer working in the unique field of Verre eglomise, the process of gilding precious metals on the reverse side of glass. The beauty of this ancient medium is that it can be used to enliven any glass surface with a luminous,ethereal quality and transform a space dramatically. It can be used in a variety of ways, both modern and classic, with many diverse applications including curved ceilings, rooms of glass, doors, tables, glass paintings, dressing rooms and hotel lifts. 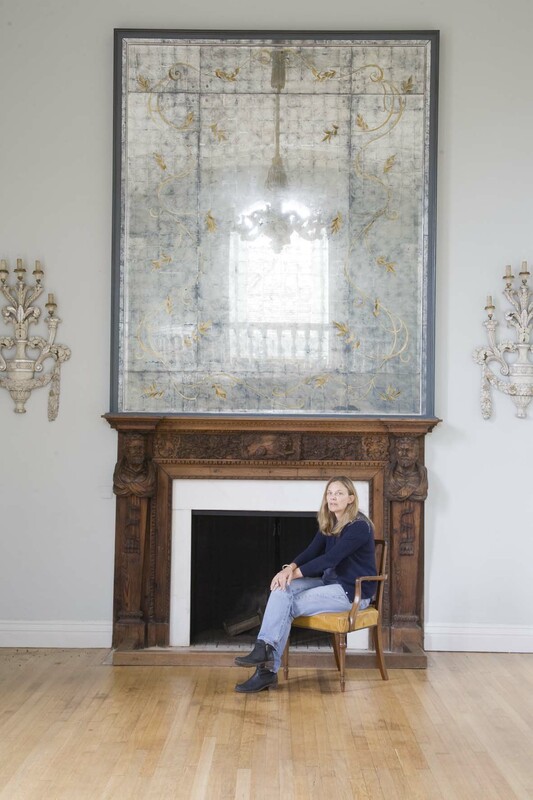 Apart from her bespoke individual work, she has collaborated with glass artists such as Kirsty brooks gilding architectural glass installations for her designs in public art. Cas’s designs have evolved from observing flowing plant forms, transferring these organic shapes into light graceful motifs and Influences from her travels in India and working in Vietnam for eight months. Cas now works from Queensrollahouse studios in Park Royal 18,Trading Estate Rd,London,NW10 7LU.